There is a song that I like since my childhood - Barış Manço's song "Sakız Hanım ile Mahur Bey (Mrs Sakız and Mr Mahur)". Back then, the characters didn't evoke any association in me, but only the story and melody used to leave me with a sweet blues. After all those years, today, a photobook which I examined has echoed the same tone in my ears; and what's more, I have become familiar with the story of Mrs Sakız and Mr Mahur. I am talking about Onur Gürkan's first photobook "Holiday". Not only have it taken me to my childhood days, but it also enabled me to establish a connection between my family dynamics in the present and those days. In fact, I think "Holiday" is a book which anyone can find something of their own, let alone myself. I guess, it will be relevant to say "Holiday" is a work that utilizes the collectivism and communion of coming from similar backgrounds and travelling to similar futures. The book consists of 3 parts: the first part conveys the "Holiday" Onur Gürkan takes with the death of his grandfather to the viewer. We find the opportunity to get acquainted with the grandfather's belongings, habits in the room he had died and Onur Gürkan with the place where his memories are buried through the photographs. As one passes from one room to another via the metaphor of curtains, we familiarize with the general atmosphere of the rooms via wide-angled photographs; and objects and details through photographs that are placed multiply side by side and pages that can be opened outwards. At this point, a question comes to my mind: "are the objects brought together with a minimum change in position within the natural process through these photographs; or were they manipulated deliberately for a specific aim and meaning?" and the first option overrides the other. After all, both options are of no significance; and I think the outcome bears the strong traces of the position the grandfather was in minds, memories, and within the family. In the second part, "Holiday" which is a result of grandmother's Alzheimer's after the death of the grandfather, is conveyed through a description of a day. Contrary to the death of the grandfather, in the second part, Onur Gürkan explains in an interview the reason for his including the recent portraits of grandmother as: "After the death of my grandfather, I looked back and realized that we didn't have any photograph together, so I started to take photos of my grandmother." Furthermore, in the photographs in the second part, one notices the trails of Diane Michals' technique of sequential storytelling. As the main concept of the book focused on remembering and resisting, I think that the grandmother who is the main character of the part is suffering from dementia constitutes a contradiction. For in fact, the dementia and photographing the home and objects are acts following a death of a loved one; and the fact that book enables one to observe closely different reactions to the death of someone by different family members – maybe the reactions that don't come to mind at first thought – and details about the process renders the book interesting. In the third and the last part, the different paper type indicates that the photographs on these pages are from an archive; and these photographs bring us together with the long vacations in which Onur Gürkan used to visit his grandparents in his childhood. In this context, we see the inevitable result of having working parents as being entrusted to grandparents, and the strong bond established with them during the time the child spends with the grandparents maybe more than parents. So, we recall facing the sadness with losing one of them or maybe both in one's 20s, and find traces similar to ourselves. On the other hand, while the photographs in the book flow, in addition to the feeling mingled with our memories and lives; the book ends with Pelin Derviş's interview with the artist, which supplies us with artist's approach to his work, his feelings and ideas about it. Aside from the emotional burden, the materials chosen deliberately render "Holiday" a really light book. 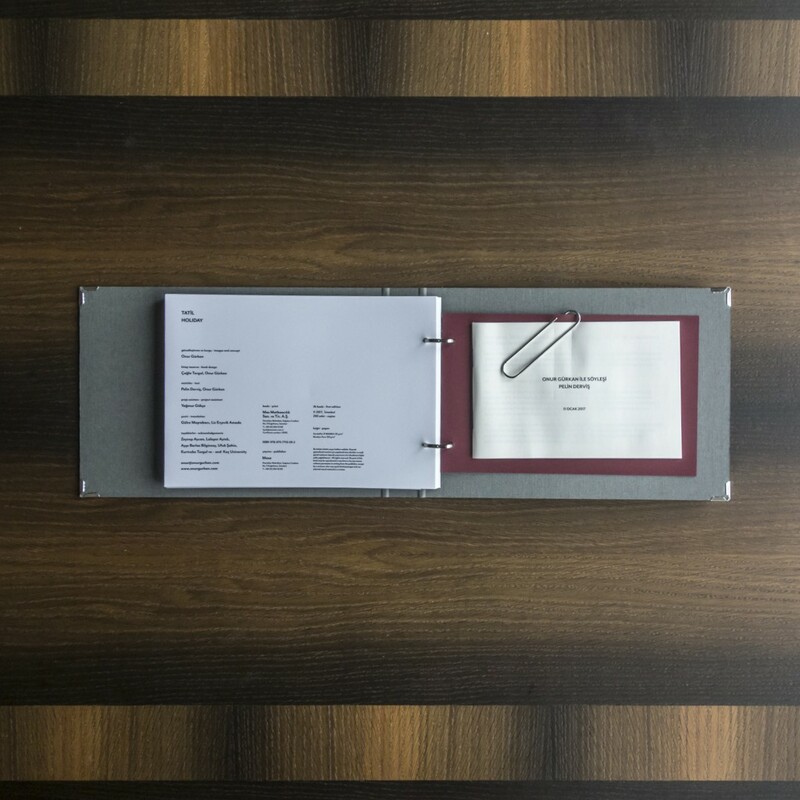 In addition, the pages in the book are presented in a file format inspired from the grandfather's habit of keeping important documents in files. This gives the book the outlook of a family album, and allows the viewer to personalize the book by changing the order and number of pages. Therefore, the design that was determined carefully supports the intense and powerful features of the content and produces an absorbing photobook as a whole. With all these properties, "Holiday" prompts one to think about family dynamics; and gives the viewer the opportunity to explore novel ways of narrating.